2006.11 – present. Principal Investigator, Guangzhou Institutes of Biomedicine and Health, Chinese Academy of Sciences. 2002.12 – 2006.11. Postdoctoral fellow, Medicinal Chemistry, Center for drug discovery and chemical biology, Northwestern University Medical School, Chicago, IL. 1999.9 - 2002.7. Ph.D. Medicinal Chemistry, Institute of Materia Medica, Chinese Academy of Medical Sciences and Peking Union Medical College, Beijing, China. 1992.9 - 1999.7. B.S. and M.S. Organic Chemistry, Shanxi University, Taiyuan, Shanxi, China. 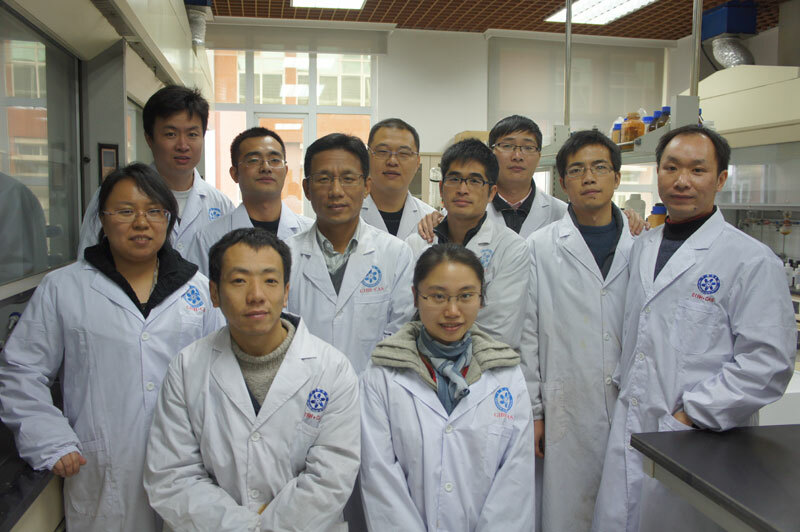 The goal of Dr. Hu’s group is to identify drug candidates for further development by collaborating with scientific teams and big pharmaceutical company. His current research areas include anti-diabetic drug discovery (DDP-Ⅳ inhibitors), anti-alzheimer’s disease drug discovery (anti-neuroinflammatory inhibitors) and anti-inluenza drug discovery (M2 inhibitors). Currently, there are two drug candidates are under preclinical studies towards IND filling. ● Xin Zhao, Chufang Li, Shaogao Zeng, Wenhui Hu*. Discovery of highly potent agents against influenza A virus. European Journal of Medicinal Chemistry. 2011, 46 (1):52-57. ● Wenhui Hu*, Shaogao Zeng, Chufang Li，Yanling Jie, Zhiyuan Li and Ling Chen. Identification of Hits as Matrix-2 Inhibitors through the Focused Screening of a Small Primary Amine Library. Journal of Medicinal Chemistry. 2010, 53(9): 3831-3834. ● Li Li Zeng, Ying Jie Ding, Gui Cheng Zhang, Hong Rui Song, Wen Hui Hu*. A practical synthesis of trifluorophenyl R-amino acid: The key precursor for the new anti-diabetic drug sitagliptin. Chinese Chemical Letters. 2009, 20: 1397-1399. ● Zhenbo Huang, Hao Wang, Xiurong Rao, Guifa Zhong, Wenhui Hu, Guoaing Sheng. Different effects of scopolamine on the retrieval of spatial memory and fear memory. Behavioural Brain Research. 2011 (221): 604–609. ● Laura K Chico, Heather Behanna, Wenhui Hu, Guifa Zhong, Saktimayee Mitra Roy, and D. Martin Watterson. Molecular properties and CYP2D6 substrates: central nervous system therapeutics case study and pattern analysis of a substrate database. Drug metabolism and disposition. 2009, 37 (11): 2204-2211. ● Lenka Munoz, Hantamalala Ralay Ranaivo, Saktimayee M. Roy, Wenhui Hu, Jeffrey M. Craft, Laurie K. McNamara, Linda J. Van Eldik and D. Martin Watterson. A novel p38α MAPK inhibitor suppresses brain proinflammatory cytokine up-regulation and attenuates synaptic dysfunction and behavioral deficits in an Alzheimer's disease mouse model. Journal of Neuroinflammation. 2007, 4:21. ● Wenhui Hu, Hantamalala Ralay Ranaivo, Saktimayee M. Roy, Heather A. Behanna, Laura K. Wing, Lenka Munoz, Ling Guo, Linda J. Van Eldik and D. Martin Watterson. Development of a novel therapeutic suppressor of brain proinflammatory cytokine up-regulation that attenuates synaptic dysfunction and behavioral deficits. Bioorganic & Medicinal Chemistry Letters. 2007, 17(2): 414-418. ● Wenhui Hu, Hantamalala Ralay Ranaivo, Jeffrey M. Craft, Linda J. Van Eldik, and D. Martin Watterson. Validation of the neuroinflammation cycle as a drug discovery target using integrative chemical biology and lead compound development with an Alzheimer’s disease-related mouse model. Current Alzheimer Research. 2005, 2, 197-205. ● Jeffrey M. Craft, Linda J. Van Eldik, Magdalena Zasadzki, Wenhui Hu and D. Martin Watterson. Aminopyridazines attenuate hippocampus dependent behavioral deficits induced by human A in a murine model of neuroinflammation. The Journal of Molecular Neuroscience. 2004, 24:115-122. ● Hong Li, Yingxue Liu, Qijun Liu, Wenhui Hu, Guochun Zhou. Synthesis of 2-amino-5-hydroxycaprolactam derivatives mediated by E-selective olefination and asymmetric oxidation of the enol ether. Synthesis. 2010, 23: 4068-4074. ● Wenhui Hu, Zongru Guo, Xiang Yi, Changbin Guo, Fengming Chu and Guifang Cheng. Discovery of 2-Phenyl-3-sulfonylphenyl-indole derivatives as a new class of selective COX-2 inhibitors. Bioorganic & Medicinal Chemistry. 2003, 11(24): 5539-44. ● Wenhui Hu, Zongru Guo, Fengming Chu, Aiping Bai, Xiang Yi, Guifang Cheng, Jing Li. Synthesis and biological evaluation of substituted 2-sulfonyl-phenyl-3-phenyl-indoles: a new series of selective COX-2 inhibitors. Bioorganic & Medicinal Chemistry. 2003, 11(7), 1153-1160. ● Wen Hui Hu, Zong Ru Guo, Ai Ping Bai, Zhi Bin Xu. A convenient synthesis of the substituted 2,3-diaryl-indole – the potent selective COX-2 inhibitors. Chinese Chemical Letters. 2002, 13(4): 296-298.